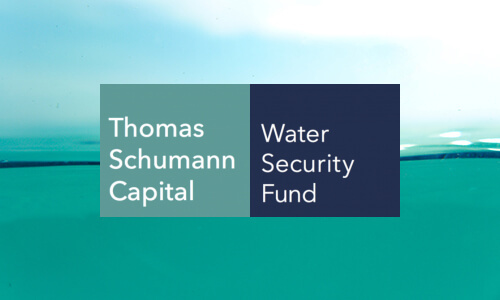 Thomas Schumann Capital (TSC) provides financial products and services to public, private and philanthropic capital to advance a water-secure world. TSC embraces social and environmental impact and responsibility, and financial outperformance. Thomas Schumann Capital partners with Finscoms to market and communicate the values of a new benchmark index and fund both of which target water security while assessing, pricing and mitigating financial water risk that corporates and publicly listed securities are increasingly exposed to. Severe droughts have caused billions of dollars of damage in Southern Europe and California and increasingly other parts of the world. Research from the World Bank suggest that since 2001, rainfall shocks have caused a loss of food production sufficient to feed about 81 million people every day for an entire year – equivalent to the population of Germany. Water risk is the biggest risk facing people, planet and profit. The total global assets under management currently estimated at $85 trillion are all directly or indirectly exposed to financial and operational water risk because of coming water crises, water scarcity, mismanagement and climate change. Water security is the single largest investment opportunity for social and environmental impact, financial outperformance. An increasing number of investors and corporates are waking up to the importance of water security. CDP’s 2017 Global Water Report shows a 193% increase in businesses leading the way on water stewardship. Per CDP’s leading global water security program a water-secure world is possible, and the transition is underway. But to deliver it, water must be recognized as a fundamental asset for all companies and cities across the globe. Water security is essential to tackling climate change and protecting the bottom line. CDP’s global water report was written on behalf of 639 investors with $69 trillion in assets. Thomas Schumann Capital are set to launch a new benchmark Water Security Index and Water Security Fund. The Index tracks corporate management of and action on water security. It informs asset owners, financial institutions and investment managers of the water risk to equities in their financial portfolios. Every security is exposed to financial water risk, which to date has no viable tool or methodology to assess and price this risk. TSC‘s Index will be the only index of it’s type in existence and of vital importance to the global investment community to secure, sustain and increase long-term alpha in public securities and investments. Both the index and fund are not thematic and operate beyond the $500 Billion water industry which grows approx. 5%-6% per year. TSC‘s vehicles are not confined to ESG and water as a niche sector, they apply to all investors and global assets under management currently estimated at approx. $85 trillion, projected to reach $145 trillion by 2025. Finscoms will work closely with TSC to help ensure the smooth launch of TSC’s Index and Fund. Finscoms will market and communicate the values of both vehicles to it’s large investor base. We look forward to a successful partnership. The intersection of vital human needs with critical physical restraints is prompting an increasing demand for the kinds of large-scale projects and daily-use innovations that may result in attractive investment opportunities across the entire water supply.